Why did they pull it! I’m so pissed. I Love it! I’m still watching! 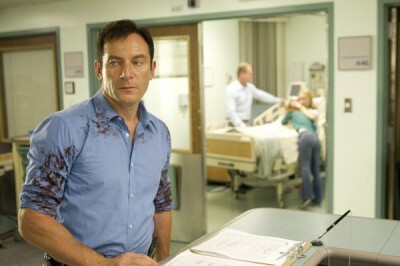 I love the premise of the story and I love Jason Isaacs!!! Please don’t pull the plug! I like AWAKE. I think the lead actor is really good. Not your “cookie cutter”, good-looking male lead type, which makes him more interesting to watch. The show can be a little hurky-jerky at times and I’m not particularly fond of the wife (her voice is annoying) but, once again, I’m sucked into the overarching plot and will hate to see it cancelled without some closure…ala Flash Forward. Give it a chance, at least one more season. Come on. I love Awake, it is always so good, please bring it back. One of the best dramas on TV, excellent acting, intriguing premise. Juuuust enough clues to make you think you’re “getting” it, before they yank the rug out from under you and confuse you again. If it’s to be cancelled I hope the decision was made early enough to allow the last episode to wrap things up. Awake NEEDS to be renewed, it is suspensful, well-written, and intellectual! I am not able to watch it every Thursday night but I make sure to still watch it! Awake is my FAVORITE show on TV right now!! This is all coming from a college student, c’mon my generation is known for non-sense like Jersey Shore. For once allow a show with substance and meaning remain on the air! Awake is an intelligent, well- written show. Sadly, that’s often the kiss of death in the ratings. I enjoy Awake. It deserves another season. Pleeeeeaaase keep it! And promote it. E.g., run a marathon catch-up, like OUAT did. It could really develop a following.